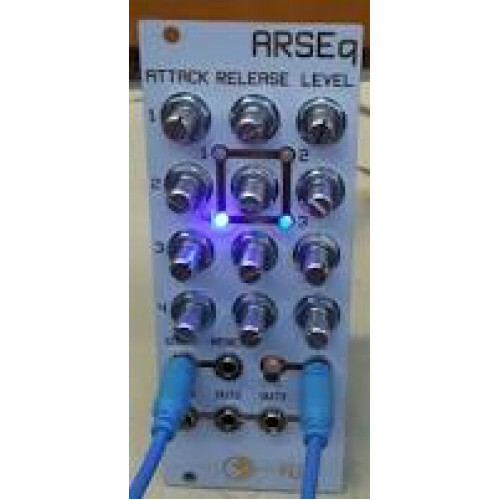 The ARSEq ( = Attack Release SEquencer) is, as the name implies a hybrid sequencer and AR envelope generator. It contains a counter circuit with reset, 4 envelope generators and a mixer/inverter stage to get the sequenced output. The envelopes can be inverted if desired to give a greater voltage and complexity range of the output sequence. The individual 4 envelopes are available on the panel as well. The main difference with this circuit and a regular EG is each envelope requires 2 clock pulses, one to start the attack and the next to start the release stage.